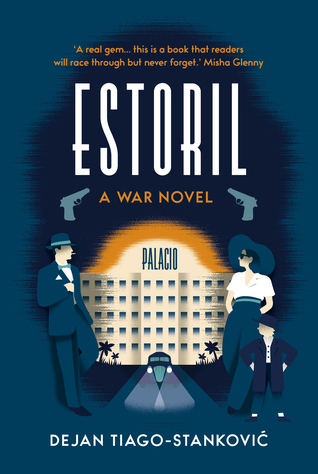 Set in a luxurious grand hotel just outside Lisbon, at the height of the Second World War, Estoril is a delightful and poignant novel about exile, divided loyalties, fear and survival. The hotel's guests include spies, fallen kings, refugees from the Balkans, Nazis, American diplomats and stateless Jews. The Portuguese secret police broodingly observe the visitors, terrified that their country's neutrality will be compromised. My thanks to Head of Zeus and Net Galley for the eARC of this novel in return for an honest review. This was a really interesting and unusual idea for an historical novel- it seems at first glance to be a spy novel, or a tale centred around a hotel, but in fact it has many more layers to it than that. I enjoyed the setting of this novel, Estoril which is a town on the Portuguese Riviera. This is a WWII novel, although none of the novel features any actual fighting. As Portugal was neutral during the War, this offers a fascinating insight, and a nice twist on the usual WWII novels. I haven't read many novels that take this perspective on the War, and this is definitely an eye-catching aspect to this novel. This novel reminds me a lot of The Grand Budapest Hotel movie. If you were a fan of the style and imagery and characters of that movie I would highly recommend this novel, as its very similar in those ways! There is a huge ensemble of characters feature in this novel, most of whom appear and reappear throughout. I loved reading about some of the characters, the little boy Gaby was one of my favourites. However, there's a particular problem with this great number of characters in my mind, and that's the overwhelming nature of such a number. The mix of historical figures and fictional characters makes for an interesting read, but I felt that there were too many characters, some of whom only appeared for a few pages and then disappeared for long lengths of the novel, was a tad confusing to keep up with. Another problem I had with the characters was specifically the character of Dusko. I actually really liked reading about him, but he had so many code names and pseudonyms that weren't clearly described, that I ended up getting quite confused about which character I was reading about, which I found really irritating, and it definitely reduced my enjoyment of the book. Another issue which reduced my enjoyment of this novel was more a formatting issue. I'm not sure if it was just the way my eARC was formatted, or if it's like this in every copy, but the chapter breaks were not clearly defined, so it was very difficult to see where the chapter was ending, and as a result it was very difficult to see when the POV changed and the narrator shifted. This was another aspect that made the novel a little difficult to read, and definitely disrupted the flow while reading it.